This one is a must try (if you can stand the zing of ginger). 2. Warm the butter in the stock pot over medium-high heat. Add shallots, ginger, garlic and carrots. Saute for 8 minutes until onions begin to soften. 3. Add thyme, sea salt and stock. Cover, increase heat to high to bring to a boil. 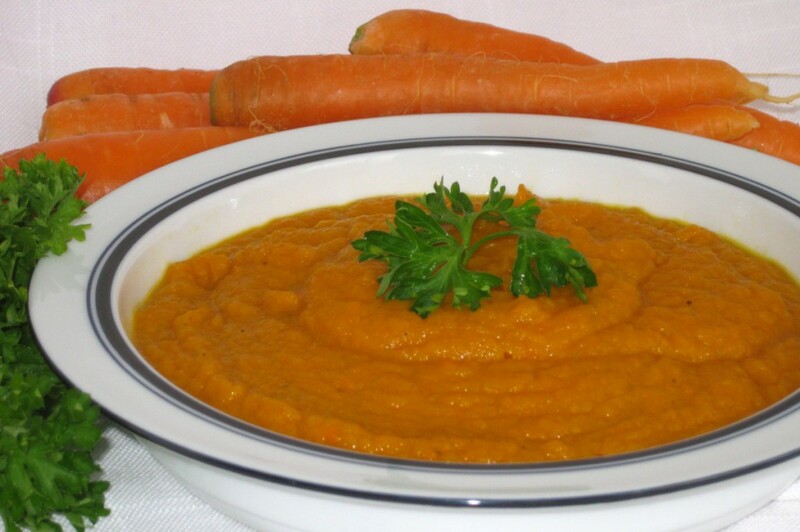 Once boiling, reduce to medium and simmer until carrots are soft, about 15 minutes. 4. Puree the soup until smooth. Add a dollop of yogurt to the top of the serving bowl before serving. Last night I was at an internship potluck! What I love about potlucks is the diversity of dishes; we had everything from Hawaiian breadfruit dishes, to indian pakoras. 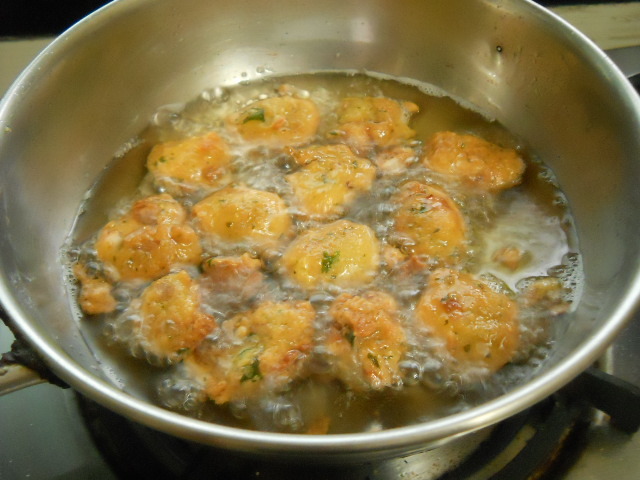 Pakoras are a favorite in India. 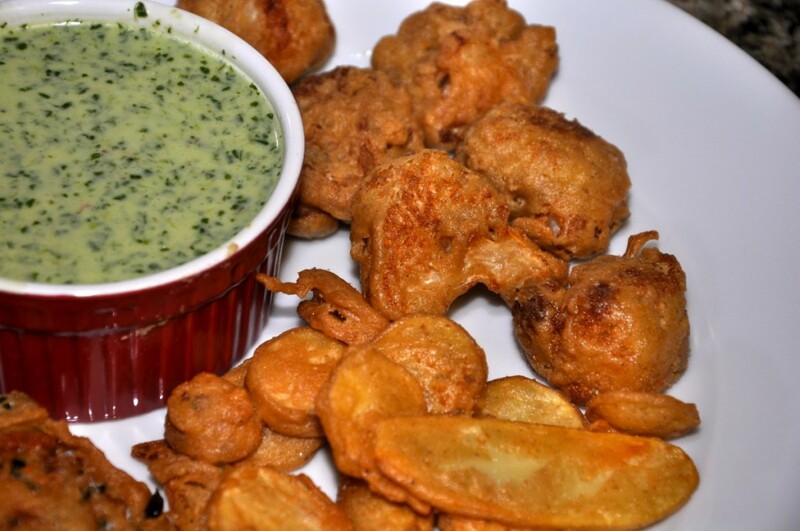 Your favorite vegetables are dipped in a spicy batter and deep fried to make fabulous fritters. 1. Sift the chickpea flour into a medium bowl. Mix in the coriander, salt, turmeric, chili powder, garam masala and garlic. 2. Make a well in the center of the flower. Gradually pour the water into the well and mix to form a thick, smooth batter. 3. Over medium high heat in a large, heavy saucepan, heat the oil to 375 degrees F (190 degrees C). 4. Coat the cauliflower and onions in the batter and fry them in small batches until golden brown, about 4 to 5 minutes. Drain on paper towels before serving. As shown in the photo above, this simple sauce can be a great dip. Just blend all ingredients together. Mint leaf, for garnishDirections1. In a medium saucepan over medium heat, combine white chocolate chips and heavy cream. 2. Stir continuously until white chocolate chips have completely melted. Stir in the half-and-half, and vanilla extract. 3. Stir occasionally until heated through. 4. 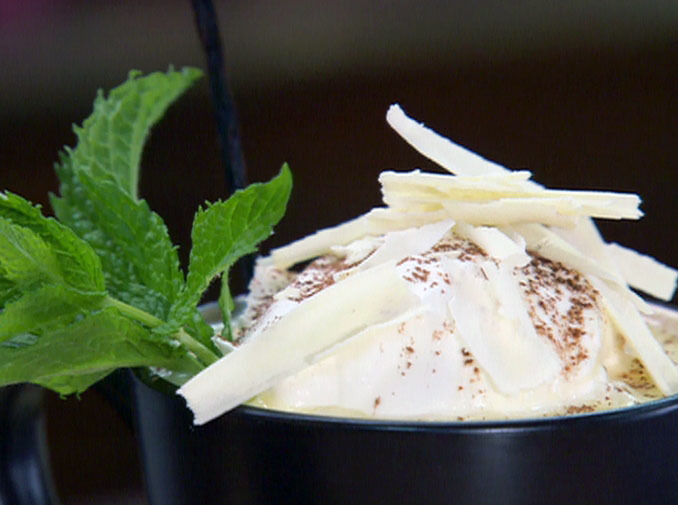 Pour into mugs and top with a dollop of vanilla whipped topping and garnish with mint leaf. Easy as 1-2-3-4! I like this recipe for its simplicity and low sugar content. Other than the white chocolate chips, no additional sugar is added. Heat oven to 325°. 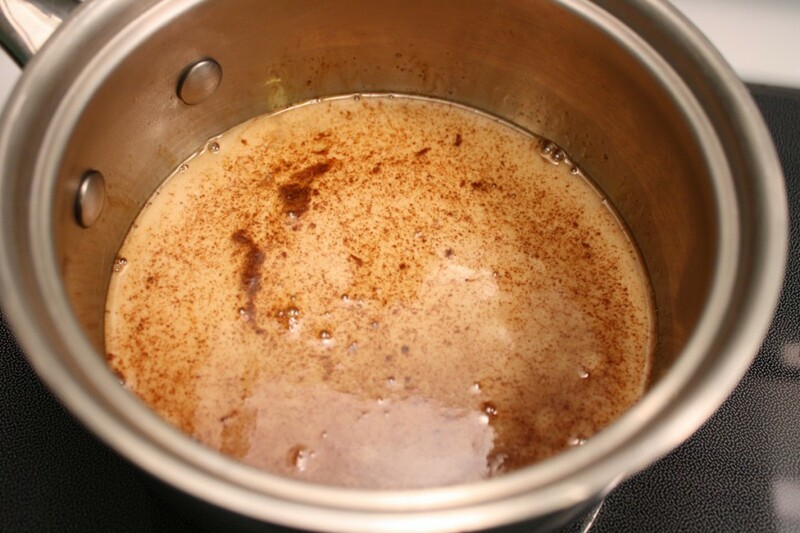 Place all syrup ingredients (maple syrup, espresso powder, vanilla) in saucepan and bring to a boil. When mixture begins to boil, remove from heat. Keep an eye on the stove, so it boil over as it gets foamy quickly! Divide the syrup 12 equal parts among the cupcake pan(s). Set pan(s) aside. 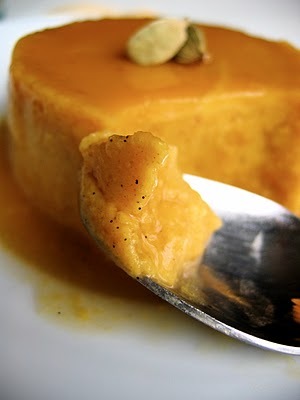 Meanwhile, blend all remaining flan ingredients in a blender for 2 minutes or until completely combined. Slowly, pour the flan batter into the cupcake cups over the syrup that was placed in the bottom. Fill to the top of the cups. Place the cupcake pan into a large roasting pan. Fill roasting pan with 2 inches of water, careful to not spill the water into the flan. 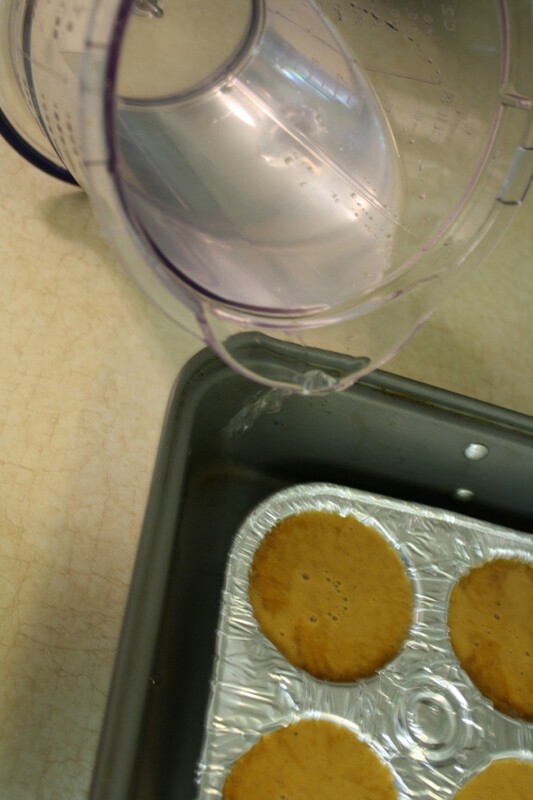 You can also put the water in first if it is easier, just allow room for the water to rise when you stick your cupcake pans in the roasting pan. Bake for 50 minutes at 325°. When the flan is done, you should be ale to insert a toothpick and have it come out clean. Place flan in refrigerator to cool completely before eating. 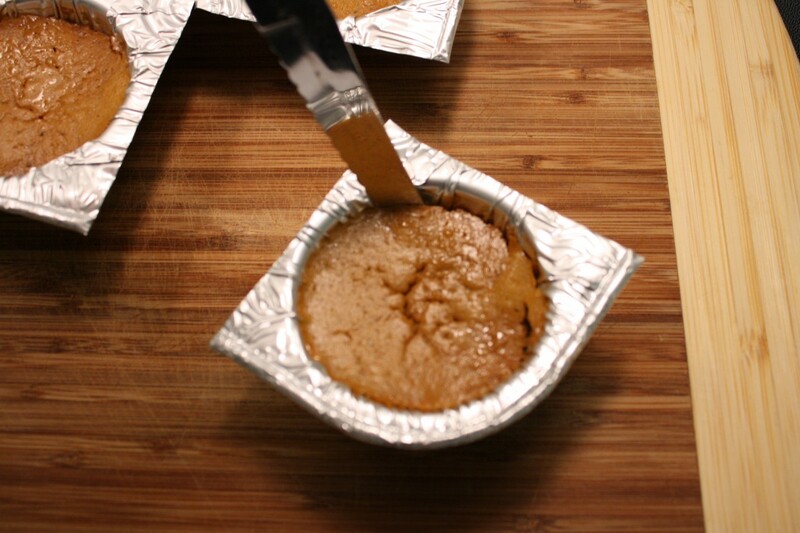 When flan is completely cool, cut the foil pans so that each flan is now separated from one another. Loosen the edges of the flan from the pan with a knife. Invert flan onto a plate, gently tapping the top of the foil pan to help it release. Don’t forget to let the syrup drizzle out on top! 1. Cook the ramen noodles according to instructions, I significantly reduced the seasoning powder so that the “bun” would not be too salty. 2. Drain the noodles. Place noodles in a medium bowl and mix in an egg. thoroughly mix in the raw egg with the noodles so that all the noodles are coated. The egg is what is going to bind your noodle bun together. 3. Split the ramen noodles in half. Pour into 2 large cylinders/ramekins that are about the size of a hamburger bun. Wrap plastic wrap over container and press down to firmly pack noodles. Add something on top to add a little weight. I added a tupperware bottom and then put a heavy can on top of that. Refrigerate for about 30 minutes to let set. 4. Meanwhile, heat up/cook your burger patty. 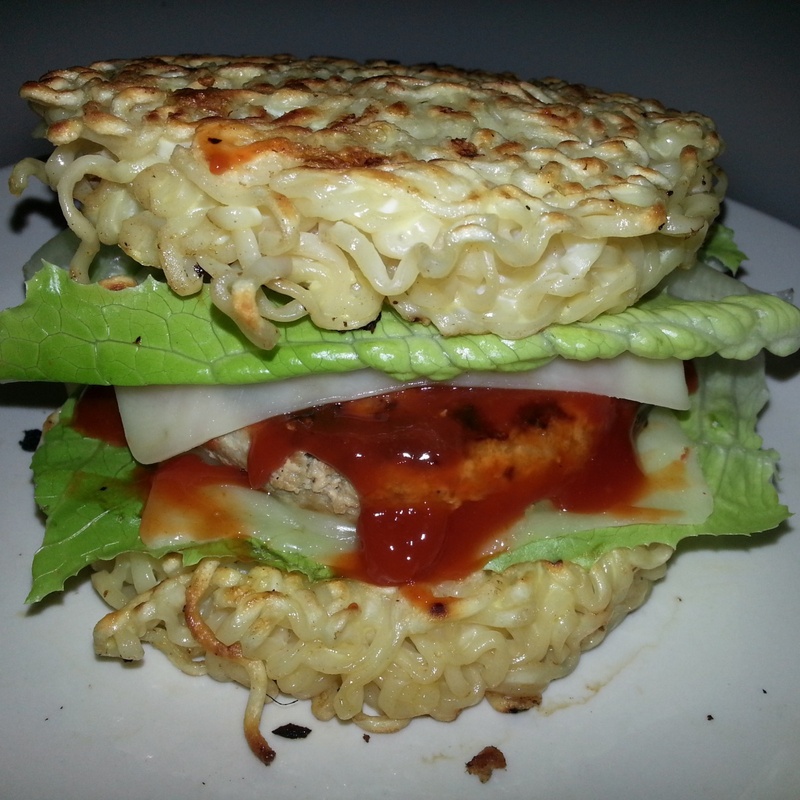 I made a free form patty with some ground beef, salt and curry powder to add some more Japanese flare. Heat up your frying pan with some oil. Flip over your ramen noodle container upside down so that the noodle bun slides easily into frying pan in one piece. Fry for a few minutes on both sides until noodles become slightly crispy. 5. Add in patty and additional toppings of your choice. Every year, right before the school year begins, my mom goes on a “meat-less” diet. Let’s just say, what mom says, goes! Don’t get me wrong, I always enjoy a savory vegetarian meal, but my mom tends to lack variety when she’s pressed for time. I was at a design client meeting, when somehow vegetarian meals came into topic. Let me be upfront when I say I am not a fan of tofu if it looks, tastes, or smells like tofu. 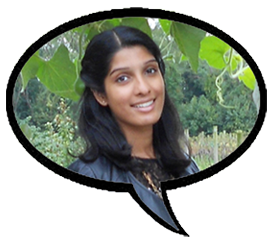 My client mentions how she made garbanzo beans taste like chicken! WHAT, WAIT, PAUSE! Needless to say, I had to try it. As well as give mom a break in the kitchen. Heat the oven to 425 degrees. Chop up the onion, bell pepper, and broccoli so that all the pieces about the size of a chickpea. Chop up the garlic into small pieces, but save it until later. Place all the chopped up veggies in a large bowl with the cooked chickpeas. Pour in the oil and soy sauce, stir, and then throw all the spices in there. Mix until everything is coated. Put all of that on a large rimmed baking sheet (like what you would put cookies on but with an edge) and bake for 20 minutes. Take it out of the oven, add the garlic, and bake for another 15 minutes. The broccoli will look a little burnt at this point but that is the plan so take it out of the oven. 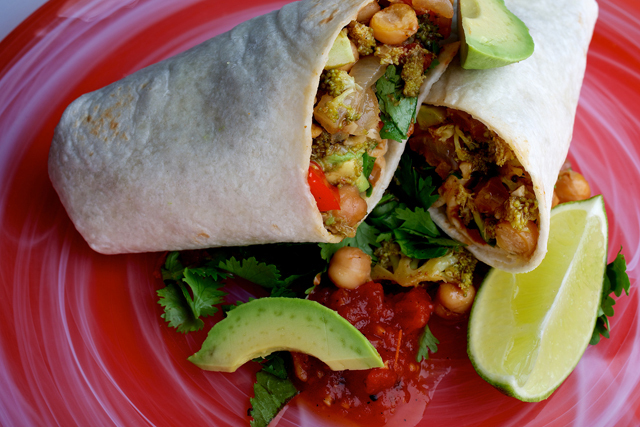 Squeeze the juice of half of the lime over the pan and stir the roasted chickpeas and veggies all around. Taste some and see if it needs more spices or anything. Now here’s your filling, make a burrito! I like mine with spinach, avocado, cilantro, and some chipotle sauce. Have you heard the buzz about CUNY Service Corps? It is a paid job opportunity for students. Yes, I said paid. I met with Professor Cinda Scott and asked her a few questions to get a closer look. Question: What exactly is CUNY Service Corps (CSC)? Answer: CSC is a great opportunity for students to make a meaningful difference through service while gaining valuable real-world work experience, earn a wage, and where appropriate, receiving college credit. Question: Who is elegible to apply? Question: What sorts of placements are available? A Healthier City: Corps members will address important community and public health issues, such as chronic disease management, childhood obesity, lead poisoning prevention, infant mortality, violence prevention, nutrition, and food security. A More Resilient and Greener City: Students will support projects related to improving the city’s built and green infrastructure and making it more resistant to storm-related damage. A Better Educated City: The Corps will offer valuable supports to students of all ages, such as those in early childhood programs (and their families and caretakers), public middle and high school students, fellow CUNY students struggling with academic and personal challenges, and adult students learning English or preparing to take the High School Equivalency examination. An Economically Stronger City: A range of projects will focus on bolstering the economic viability and success of distressed communities within the city. Question: Where can I find out more? Answer: There are many info session on campus. Question: Is there a deadline? Answer: June 1st, 2013, apply now! The Crood’s live strongly by their family motto ” New is always bad. Never not be afraid.” Exactly as it sounds, they never surrender to curiosity, or stray from routine. All but Eep (voiced by Emma Stone) believe these precautions are necessary for survival. Emma Stone’s voice is well suited for Eep, the oldest child, who hates the rules, the cave, and her family. She desires exploration of new things and is abnormally strong. Emphasis on strong, because this type of strength is not often seen in animated female characters. Her typical love-hate relationship with her father (Nicholas Cage) provides the emotional core of this story. Eep: Dad, you have to stop worrying about us. Grug: But it’s my job to worry! It’s my job to follow our traditions. Eep: Those traditions don’t work out here. Grug: They’ve been keeping us alive. Eep: That was not LIVING! It was “Not Dying”! There’s a difference. After their cave is destroyed in a rockslide, the Crood family ventures into strange and uniquely visualized territory in search of a new home. Head of the family, Grug (Cage) deals with internal conflicts when he encounters an imaginative nomad named Guy who is the polar-opposite to his “change-fearing” character. Guy introduces them to fire and shoes, and the concept of using your brain to express an idea. Where this film really makes an impression, is that instead of Eep and Grug meeting in the middle, Grug realizes that he has to accept the new world and find a way to be useful in it. Grug’s old way of conservative living becomes obsolete by the end of the movie, and he’s forced to embrace a new way of life. His internal struggle goes through several stages: patriarchy to burdensome to abandonment and finally rebuilding through acceptance and adaptation. 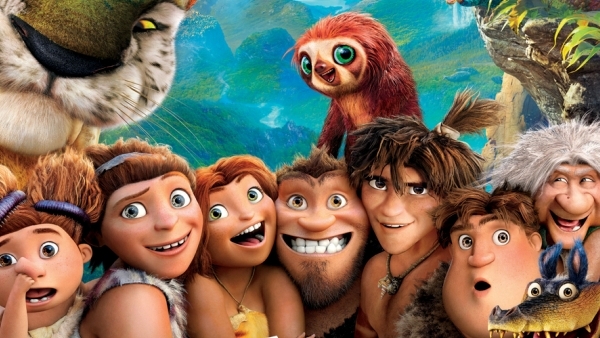 The journey to their new home helps the Croods overcome their fear of the world that exists beyond their cave. They discover an imaginative and colorful environment of prehistoric hybrid creatures and plants. The viewer is able to see them evolve emotionally which is very heartfelt. Grug invents the hug (rhymes with his name) exclusively for his daughter Eep, as a way to express his affection. The Croods offers food for thought about relationships, change, and perspective on why the challenge of family is worth the struggle. Although I do not have a favorite part, I enjoyed the movie’s faux explanations for specific inventions and conventions, such as “Grug’s hug” and belts. 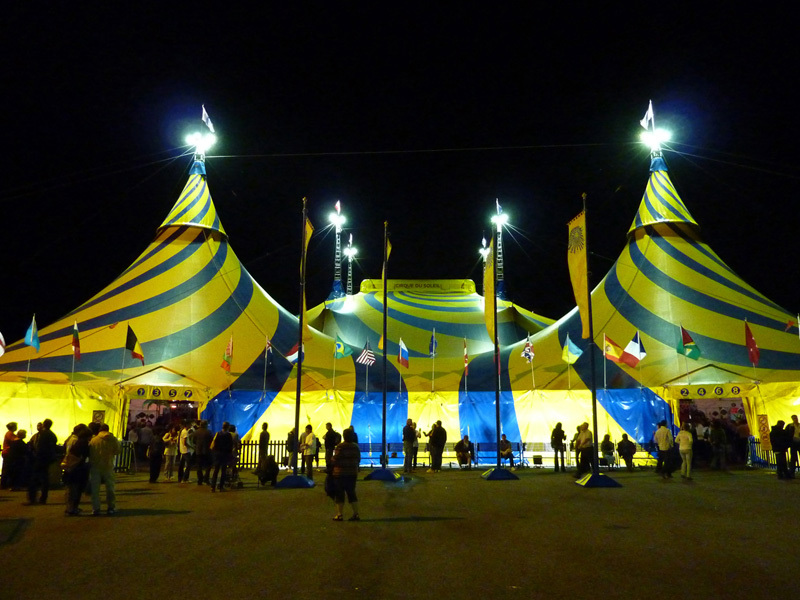 Cirque du Soleil’s TOTEM is on tour in Citi Field Queens until 23 June 2013. This show’s theme revolves around the evolution of mankind from its primordial, amphibian state and toward the desire of flight.Totem reflects the continued development of the aspirations of human evolution by combining many acrobatic skills, costumes and music, making each act truly unique. This performance also included a live orchestra and vocals, which were mesmerizing. Although the musical score was not focused on the traditional music of the native tirbes as one would assume, it was a harmonious balance of a variety of cultures. It samples Asian, South Asian, Italian and Tribal music. The combination of these cultures was exhilarating. I’ve attended a few of their performances, and must say I always enjoy their stage setup. Totem’s stage was an artistic interpretation of a pond. I won’t elaborate, so I don’t spoil the visual for you. Cirque du Soleil’s seating arrangement is very well thought out. Sometimes while attending shows, we get seating near the infamous blind spots. Whether you are seated behind a pole, a pillar or a rather tall audience member. The distribution of audience spacing in this show is great because the acts look amazing from any angle in the almost 360 seating. The space between the rows are far enough that even if you are slouching in your seat, the person in front of you doesn’t affect you. The little, subtle details always seem to speak loudest to me. The storyline of the characters was lightly emphasized in this performance. Normally, Cirque has an overall story that the characters fit into. The story line was all over the place. Nevertheless, the concoction of magic and, gravity defiance was nothing short of amazing. Acts in this show focused heavily on strength, coordination and agility. There were a few death defying acts, where I realized I forgot to breathe. These performers definitely do not have trust issues. As a youth, Pi explores a sense of self through religions. His interest is so passionate that it leads him to take on an odd lifestyle. Pi creates a hybrid worship of god, and became a Muslim-Hindu-Christian. Although his mother is a Hindu, and father a believer of science and logic, all this diversity only makes their family bond stronger. His father, a businessman, and an owner of many animals is the caretaker of a zoo. In an effort to escape political changes in India, Pi’s father decides to migrate to Canada by Japanese cargo ship. This is where Pi’s journey of self truly takes flight, or should I say, sets sail. While sitting in the theatre watching Pi’s journey unfold, the viewer is also sent on a visual journey. We meet memorable characters and face heart-wrenching situations alongside Pi. Director Ang Lee’s ability to captivate the viewer did not falter throughout the film. The musical score creates an atmosphere of tranquility while seated in the theatre. Imagery so pure and spellbounding you often forget where you are. As a graphic designer, I have a habit of looking for graphic inconsistencies. If there were any, I failed to notice a single one. I wish I could describe the marvels of this film in more detail, but my words would fall short. This movie is an experince worth every moment in the two hours and seven minutes of runtime. Although the ending of Life of Pi might be controversial, this brings forth the opportunity for the viewer to explore the two possible endings. The choice remains in their hands, one ending favoring logic and reason, and the other being spiritual and emotional. Final words, do not wait for the dvd or netflix release. This movie deserves and needs to be seen on the biggest screen you can find. As Pi states in the movie, be prepared to hear a story that just might “make you believe in god,” and if not, the story alone is sure to stay with you long after you leave the cinema. Welcome to The Buzz, a project by your student community team. The Buzz is student blogging site dedicated to all things CityTech--from how to handle the pressures of school, to what movies to see. One of us will post something three times each week, so check back often to join the discussion! And be sure to join the project to get regular updates!